What It’s About: In this early “grown-up” animated feature, utopian Pepperland is under assault by the music-hating Blue Meanies. A magical yellow submarine escapes to retrieve The Beatles to come to the rescue. 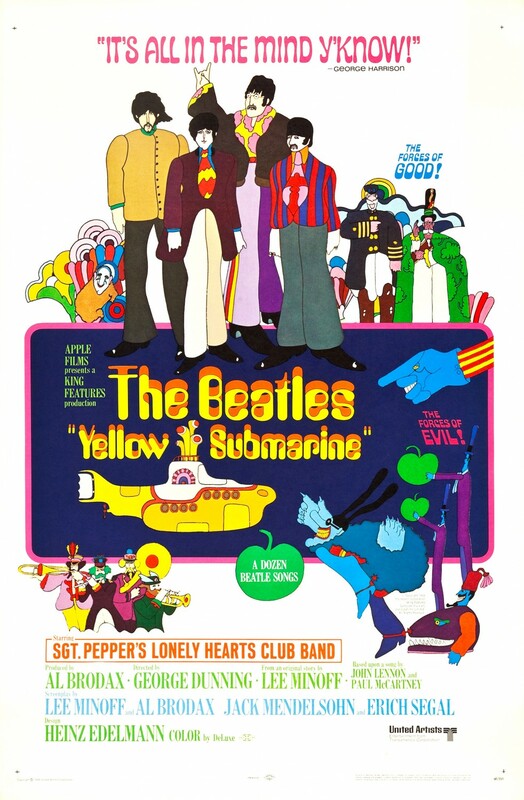 The comic adventure plot isn’t too drastically different from The Beatles’ earlier feature films (Help!, A Hard Day’s Night), but the change from live-action to animation makes the movie significantly more psychedelic and eclectic; it’ll feel extremely familiar to fans of Peter Max or Terry Gilliam. Such psychedelic classics as “Lucy in the Sky with Diamonds” feature prominently. (The “Lucy” sequences, which feature rotoscoped images of Fred Astaire and Ginger Rogers, are among the film’s most beautiful.) Warning: do not watch this film if you have a negative reaction to strobe effects (e.g., because of epilepsy). Why Watch it Today? : The Beatles’ first appearance on the Ed Sullivan Show occurred on this date fifty years ago. That was the catalyst for Beatlemania striking the United States. If you’re a Beatles fan who hasn’t watched this movie in a long time, consider watching it again: the sequence for “Hey Bulldog,” part of the original British release of the film, only made it into the US version in 1999. This entry was posted in Action, Animation, From Beyond the Grave, Movie of the Day, Music, Road Trip, The Original and tagged animation, Beatles, Blue Meanies, George Harrison, Heinz Edelmann, John Lennon, LSD, Monty Python, Paul McCartney, Pepperland, Peter Max, psychedelic, Ringo Starr, Sergeant Pepper's Lonely Hearts Club Band, Sixties, Terry Gilliam, Yellow Submarine. I canNOT overemphasize the stunning impact of seeing this in a theater when it was first run – at the tender age of 11. Having your mind expanded at that youthful point made a lot of future decisions perfecty clear, to say the least.